Dan Dawson’s power-play goal with four seconds left in the third quarter gave the San Diego Seals the lead for good in a 13-12 victory over the Saskatchewan Rush on Friday evening at Pechanga Arena San Diego. Dawson’s goal off Austin Staats assist broke a 10-10 tie. The Seals increased their lead to 12-10 on Garrett Billings goal two minutes, 34 seconds into the fourth quarter. Curtis Knight scored for the defending National Lacrosse League champion Rush 13 seconds later. The Seals regained a two-goal lead when Casey Jackson scored with 8:01 to play. Saskatchewan again pulled within one with 7:27 left on Robert Church’s goal, but neither team scored the remainder of the game. Kyle Buchanan had four goals and four assists and Billings one goal and nine assists as the expansion Seals (8-4) won their fourth consecutive game to increase their lead over the second-place Rush (6-6) to two games in the race for the West Division lead. Both teams have six games remaining. The Seals led 4-2 at the end of the first quarter and 7-5 at halftime before a crowd announced at 6,163. Dawson, Jackson and Staats each scored twice and Turner Evans and Connor Kearnan once each for the Seals. Ben McIntosh scored three times, Jeff Shattler twice and Church, Chris Corbeil, Knight, Ryan Keenan, Mark Matthews and Jeremy Thompson once each for Saskatchewan. The Seals led in shots, 56-51. The Seals scored on two of three power-play opportunities, the Rush one of two. Seals goaltender Frank Scigliano (8-4) made 39 saves. Saskatchewan goaltender Adam Shute (1-3) made 41. 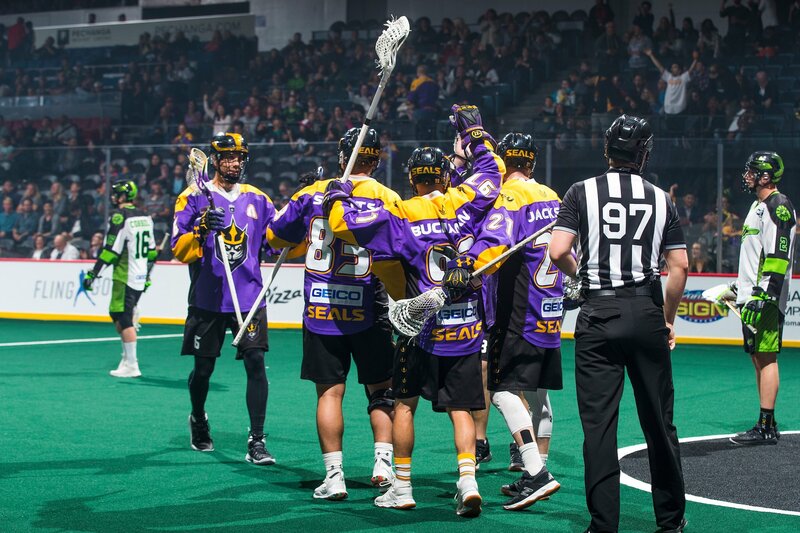 The Seals would be assured of a playoff berth if the Colorado Mammoth defeats the Vancouver Warriors on Saturday. The Seals will next play March 30, playing at Calgary.